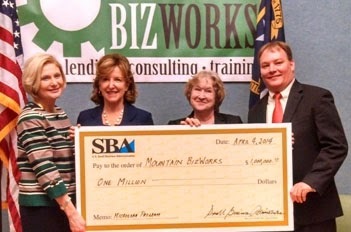 US Senator Kay Hagan and representatives from the Small Business Administration (SBA) gathered in the Mountain BizWorks office to present the organization with a check for $1 million to lend to local, small businesses. U.S. Senator Kay Hagan, a member of the Senate Small Business Committee, today visited Mountain BizWorks in Asheville, a non-profit community development financial institution (CDFI) serving Western North Carolina, for the presentation of a $1 million loan from the Small Business Administration (SBA). Mountain BizWorks provides business loans and coaching to new and established small businesses in Western North Carolina unable to access financing from banks and other traditional sources. Mountain BizWorks will use the loan to provide microloans to small business in Western North Carolina. Since 1989, Mountain BizWorks has provided $9 million in loans to 715 small business owners who otherwise would not be able to get the financing to start or expand, creating 3,500 jobs in Western North Carolina.